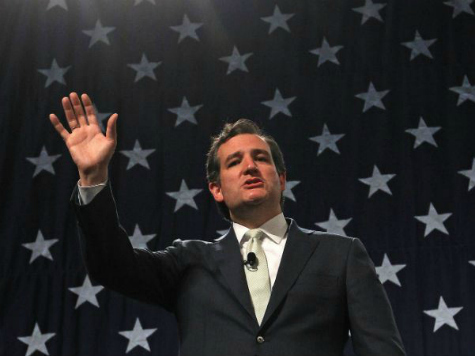 Last night, Ted Cruz stood up to offer the keynote address to a room full of Middle Eastern Christians and their allies at a somber but celebratory gala dinner dedicated to Christian unity in the face of persecution and genocide. 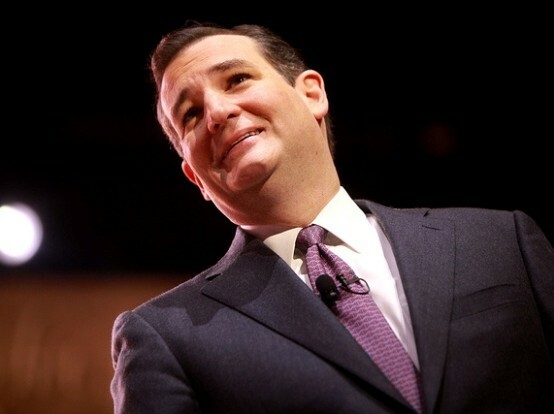 Soon thereafter, he stalked off under a chorus of boos, with the senator declaring the room to be full of hate and saying, “If you will not stand with Israel and the Jews, then I will not stand with you.” The entire transcript of his remarks is included below, along with the complete audio I recorded 20 feet from Senator Cruz and the stage. The plight of Christians in the Middle East has swept to the fore of public consciousness in recent weeks, as ISIS and related organizations have systematically persecuted and murdered Christians, driving them from homes that date back to the very beginning of Christendom. The In Defense of Christians Summit was organized to bring together Christians of every sect and denomination to stand in solidarity with their persecuted brethren. Summit participants spent Wednesday on Capitol Hill, meeting with members of Congress to drive home their message. Ted Cruz, however, fractured that unity. Hours before his keynote yesterday, The Washington Free Beacon ran a customarily nuanced headline, blaring “Cruz Headlines Conference Featuring Hezbollah Supporters.” The story referenced several of the leading Middle Eastern Christian leaders present and their own remarks about their region’s politics, taking particular pains to note that Maronite Patriarch Cardinal Mar Bechara Boutros Raï has an open dialogue with Hezbollah, the Shi’ite Lebanese political party and State Department designated terrorist organization. Lebanon has a long history of inter-religious conflict and is split between Sunni, Shi’ite, and Christian communities. Many Christians in the region have either allied with or received shelter from Shi’ite Muslim communities, in the face of radical Sunni organizations like al-Qaeda and ISIS. #Lebanon Ambassador Antoine Shedid along with 3 Parliamentarians walked out on @SenTedCruz speech with him lecturing on Israel. In Defense of Christians executive director Andrew Doran later came to the stage to acknowledge the sensitivity of the Israel–Palestinian issue, but urged, “For the love of God, we’re here to talk about Christians and we’re here to be united.” When Cardinal Raï took the stage after the dinner, he related an old Lebanese saying, “At every wedding, there are a few wedding crashers,” and said he was sorry for the events earlier that evening. He urged all in the crowd to put the unpleasantness behind them, an urging that echoed through the remarks of all the leaders speaking that night. In this case, a few politically motivated opportunists chose to divide a room that for more than 48 hours sought unity in opposing the shared threat of genocide, faced not only by our Christian brothers and sisters, but our Jewish brothers and sisters and people of other all other faiths and all people of good will. Tonight’s injection of politics when the focus should have been on unity and faith, momentarily played into the hands of a few who do not adhere to IDC’s principles. They were made no longer welcome. While the Cruz incident was a low-light for the summit, the Christian leaders gathered at the dinner continued to make vigorous defenses of the separation of church and state and the importance of inculcating pluralism in the Middle East. I sat next to an Iraqi man whose family had been turned out of their homes and had to flee the area their people had settled for thousands of years. Those sufferers should be the focus in discussing IDC and its summit, and they should not be made into pawns or proxies for other conflicts. Good evening. Today we are gathered at a time of extraordinary challenge. Tonight we are all united in defense of Christians. [applause] Tonight we are all united in defense of Jews. [applause] Tonight we are all united in defense of people of good faith who are standing together against those who would persecute and murder those who dare disagree with their religious teachings. [applause] Religious bigotry is a cancer with many manifestations. ISIS, al-Qaeda, Hezbollah, Hamas, [applause] and their state sponsors like Syria and Iran, [applause] are all engaged in a vicious genocidal campaign to destroy religious minorities in the Middle East. Sometimes we are told not to loop these groups together, that we have to understand their so-called nuances and differences. But we shouldn’t try to parse different manifestations of evil that are on a murderous rampage through the region. Hate is hate. And murder is murder. The group that hosted one of the largest ecumenical Christian gatherings to address religious persecution in years last Wednesday night, which was crashed in dramatic fashion by junior Senator from Texas Ted Cruz, is calling for an apology from The Weekly Standard for remarks made by senior editor Lee Smith on Twitter regarding the incident. Smith accused the crowd of showing its “ISIS face” when some in the crowd, which included many Arab Christians, booed the Senator for goading them with successively more politically-charged lines about Israel. 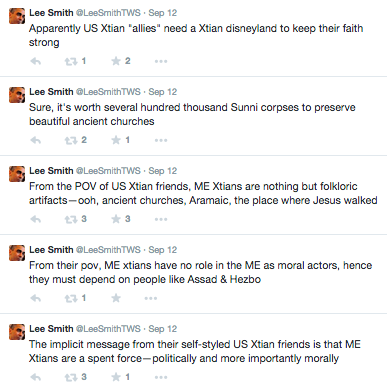 The same day, Smith ranted that American Christians could not possibly be sincere about their concern for their Middle Eastern brethren. “IDC agrees with Smith’s previous writing on the importance of the preservation and protection of the ancient Jewish community in Alexandria, Egypt, and Eliahou Hanabi, the community’s last remaining synagogue. Christians in the Middle East are facing systematic persecution by ISIL terrorists, and rather than calling for their preservation and protection, Smith mocks Middle East Christians and Americans who are standing up for their protection,” Cella added. Smith’s complaint that Americans see Middle Eastern Christianity as a “spent force” is also interesting, given that the diminution of Christian political power in the region is directly tied to American and American-backed upheavals in the region, including the second Iraq invasion and the Arab Spring. Or our involvement in sending weapons to the Syrian rebels since 2012 – the House approved the same action yesterday – many of which are likely in the hands of ISIS. Most estimates hold that the number of Christians in Iraq has declined by around a million from 2003. How much more “spent” does Smith need them to be? One might point to commentators like Smith, or certain conservative outlets that initially put the word Christian in scare quotes in their reporting on the incident. We’ve requested comment from Weekly Standard editor Bill Kristol and will update this story if we hear from him.